If you’ve ever had a flooded basement and own a sump pump, you’ll gladly admit that having a sump pump battery backup system gives you immense peace of mind on par with a home insurance policy. You do have a battery backup system right? If you live in an area susceptible to sub-level flooding you’re definitely aware of the threat and the potential for severe water damage to occur. Even a small flood that brings in a few inches can wreak havoc on your home. It’s common to think about basement or crawl space flooding when you talk about sump pumps, but if you own a water heater (and you probably do! ), you’re at risk of your own flooding should your 50-gallon water tank spring a link or sustain a bursting pipe or joint. Indeed these special pumps are used primarily in basements where excessive rain waters can penetrate and collect. If you home is located in a real flood zone, located close to the water table or subject to frequent long downpours you should really consider one. While a sump pump is terrific when it does what it’s supposed, what if something goes wrong with it or its power source? There are countless stories on the web and maybe even from your neighbors, about a pump going bad or power going out and their house flooded despite having this protective measure in place. Power is your best friend once you’ve invested in a sump pump. That’s where a battery powered sump pump system comes in. Let’s take a look at what these are all about and see if it’s something that could put you at ease. What Is a Sump Pump Battery Backup? Just as it sounds, a pump that is powered by a battery works even when there’s no electricity. Picture a fierce storm and an accompanying black-out. Penetrating water can still be pumped away. Sounds pretty logical doesn’t it? It’s important to know that just about every application of a sump pump battery backup assigns it as a backup to an existing A/C powered pump. Its true job then is to act as a backup in case of an emergency. What emergencies are these? Well, your first pump may not actually be available for more reasons than you care to accept. Other than the obvious power outage point, a primary pump could malfunction mechanically, or an obstruction could occur, rendering the pump useless. Other damage or even age can create problems as well. The other reason to have a backup sump pump in general is in case there is an excess of water that the first pump just can’t handle. Sump pump battery backup systems are smart devices. They have to be to realize when they’re needed, i.e. they are in sync with your main pump and know when to come on when the other doesn’t. Operating features usually include automatically recharging after power is restored. They also help to alert you should they have their own problem. This includes sounding an alarm if the battery has lost its charge or won’t charge or sending a message to your phone via an app or email. Also, if the battery is low on it’s fluids, battery acid and distilled water it will let you know it needs maintenance. An alert can also be initiated whenever the system has been in operation – to let you know your backup kicked on, so you can address the reason why, especially if unknown. What About Sump Pump Batteries? These batteries are generally good quality. You truly want the finest you can afford, since your sump pump backup battery system is only as good as it’s power source. Most systems that have failed to do their job are because of a dead battery. 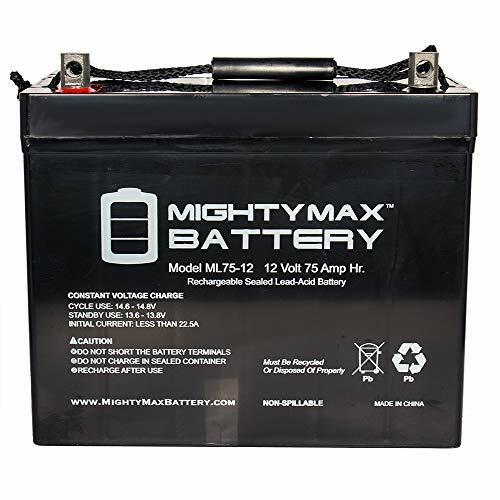 The type of battery is always a 12-volt, such as a group 27 marine battery. The best sump pump batteries are those that are deep cycle and don’t require you to add acid or water on a regular basis. They come sealed and never need attention that way. You won’t have to be exposed to chemicals. These are termed maintenance free batteries. Sump pump batteries can run a pump continuously for about 7-8 hours. If you factor in the “duty-cycle” rating, they can run longer. This just adds in the time that the pump is not running, but the battery is not recharging but is idle. They will always plug into your home’s standard 120-volt outlet. Keep in mind that not all backup sump pump batteries work on all manufacturers’ models. Different brands will often design products to use their own specific batteries. An example is the Watch Dog brand. You can use all-purpose 12-volt batteries in some cases, but it’s probably better to invest in a battery made for this application, i.e. to run your backup sump pump. You can buy more robust, thus more expensive batteries that will give you longer pumping time and longer life-expectancy. The battery life for your sump-pump can increase dramatically the more you spend on a quality battery. If you’re thinking about installing one of these nifty devices in your home, consider the following. Disadvantages are included so you’re not just reading hype here. Peace of mind. There’s no price you can put on this. You simply don’t know when/if your primary pump could go out or if power can fail when you need it most. That is the number one and frankly, THE reason to get one of these installed. Expense. It’s true that it costs more to add an extra pump. Prices run from about $150-$300. Seems pretty small though compared to the damage you might incur from even one flooding. Maintenance: It’s pretty easy work, but having a sump pump battery backup, means one more thing to attend to. You’ll have to add fluids to batteries that require it and replace sump pump batteries every 4-5 years. Installation: Putting one of these in doesn’t take much at all, but you do have to build a platform for the battery, mounting and elevating off the floor. You’ll need to do this close to a power source, which should already have for your first sump pump. Which Sump Pump Battery Backup System to Buy? The Wayne brand (see in photo) is the most trusted one on the market. It’s regarded by homeowners and plumbers as being very reliable. It’s always a good sign when you hear a lot of plumbers using these. StormPro and Watch Dog are also good brands. Watch Dog offers a bundled model, which may be the way to go in your case. Here are some final thoughts on a sump pump battery backup decision. You can actually install a backup sump pump and battery yourself. If there is no existing pump, then you’re most likely going to hire a plumber to do it. Just make sure they are experienced putting in a dual system, i.e. two pumps. When pricing these systems, check whether or not they come with a battery (and/or acid). Not all do, so make sure you don’t need to buy too many accessories separately beyond the pump and motor. 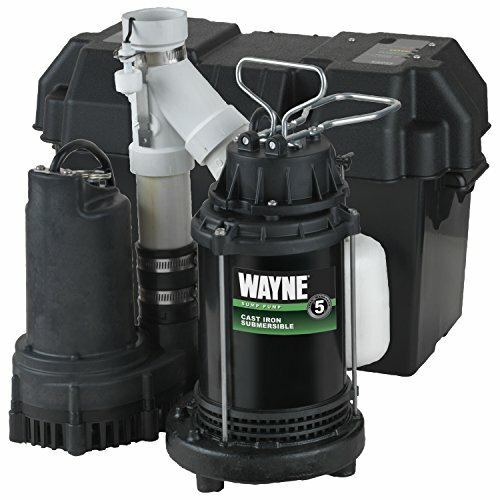 Better, more expensive brands do have superior products when it comes to battery powered sump pumps. You’ll also receive better tech support and customer service to help with questions or warranty status. Many systems these days come bundled with a first pump and a battery back up one. The back up will be smaller (e.g. fewer gallons per hour GPH), but that’s okay. Remember, it’s only there as a backup. Buying a combination set will save money, and they are usually preassembled in the factory box. 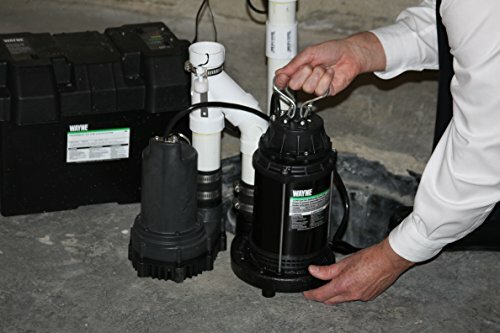 If you already have one sump pump, and want to upgrade and add a battery backup model, you should do so if your existing one is more than 4 or 5 years old. You don’t want to rely on a battery backup sump pump to kick on every time you have a heavy rain. Use it as your backup in an ’emergency’. In other words, make sure your primary pump is adequate, and only calls upon the the backup pump in dire instances. If it’s kicking on every rain storm, then you need to upgrade your primary pump. Even with all the peace of mind, it never hurts to check on the status of your system from time to time – you never know. Use a surge protector where plugging in the control unit for your sump pump battery backup device. It never hurts to take this extra precaution and add protection for your pumps.